Instead of completing my assignments and final year project, I nearly spent most of my free time watching anime. Well, not to say the best, but this is one of my nice anime which I would want to read the manga some day. Unfortunately, this anime only have 25 episodes and they 'might" have second season about it (since the manga is still going on). It is a mix of drama, comedy and action anime and I prefer anime with these genres. Nougami Neuro, the series' protagonist, is a demon from hell who eats mysteries and riddles. After eating every single mystery in hell, he decides to come to Earth. Meanwhile, Katsuragi Yako's father was assassinated in a very unfamiliar fashion, the classic, sealed room murder. The police classified the murder as suicide due to lack of evidence to be considered an assassination. 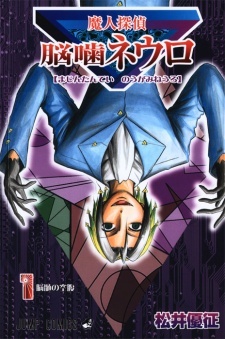 Neuro finds Yako's mystery to be the greatest and realizes this mystery will be the one to fulfill his desire. They both open a detective agency, while Neuro solves all the mysteries, Yako gets accredited for them. The two solve the weirdest yet extremely challenging mysteries the city has to offer. Yako Katsuragi always being bullied by Neuro and I wonder how she could survive from him. This is Nougami Neuro, with his poker face and normal face. It's creepy but funny as well. Oh Gosh, I love his laugh. Epic laugh is epic. Sai is one of their wanted enemy though. He seems to look alike with Allen in the anime D.Gray-man.